In a world where resources are scarce and urban areas consume the vast majority of these resources, it is vital to make cities greener and more sustainable. Advanced systems to improve and automate processes within a city will play a leading role in smart cities. From smart design of buildings, which capture rain water for later use, to intelligent control systems, which can monitor infrastructures autonomously, the possible improvements enabled by sensing technologies are immense. Ubiquitous sensing poses numerous challenges, which are of a technological or social nature. 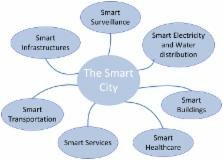 This paper presents an overview of the state of the art with regards to sensing in smart cities. Topics include sensing applications in smart cities, sensing platforms and technical challenges associated with these technologies. In an effort to provide a holistic view of how sensing technologies play a role in smart cities, a range of applications and technical challenges associated with these applications are discussed. As some of these applications and technologies belong to different disciplines, the material presented in this paper attempts to bridge these to provide a broad overview, which can be of help to researchers and developers in understanding how advanced sensing can play a role in smart cities. Rayleigh, Brillouin and Raman scatterings in fibers result from the interaction of photons with local material characteristic features like density, temperature and strain. For example an acoustic/mechanical wave generates a dynamic density variation; such a variation may be affected by local temperature, strain, vibration and birefringence. By detecting changes in the amplitude, frequency and phase of light scattered along a fiber, one can realize a distributed fiber sensor for measuring localized temperature, strain, vibration and birefringence over lengths ranging from meters to one hundred kilometers. Such a measurement can be made in the time domain or frequency domain to resolve location information. With coherent detection of the scattered light one can observe changes in birefringence and beat length for fibers and devices. The progress on state of the art technology for sensing performance, in terms of spatial resolution and limitations on sensing length is reviewed. These distributed sensors can be used for disaster prevention in the civil structural monitoring of pipelines, bridges, dams and railroads. A sensor with centimeter spatial resolution and high precision measurement of temperature, strain, vibration and birefringence can find applications in aerospace smart structures, material processing, and the characterization of optical materials and devices. Many sensor networks have been deployed to monitor Earth’s environment, and more will follow in the future. Environmental sensors have improved continuously by becoming smaller, cheaper, and more intelligent. Due to the large number of sensor manufacturers and differing accompanying protocols, integrating diverse sensors into observation systems is not straightforward. A coherent infrastructure is needed to treat sensors in an interoperable, platform-independent and uniform way. The concept of the Sensor Web reflects such a kind of infrastructure for sharing, finding, and accessing sensors and their data across different applications. It hides the heterogeneous sensor hardware and communication protocols from the applications built on top of it. The Sensor Web Enablement initiative of the Open Geospatial Consortium standardizes web service interfaces and data encodings which can be used as building blocks for a Sensor Web. This article illustrates and analyzes the recent developments of the new generation of the Sensor Web Enablement specification framework. Further, we relate the Sensor Web to other emerging concepts such as the Web of Things and point out challenges and resulting future work topics for research on Sensor Web Enablement. One of the main challenges of today's society is the need to fulfill at the same time the two sides of the dichotomy between the growing energy demand and the need to look after the environment. Smart Grids are one of the answers: intelligent energy grids which retrieve data about the environment through extensive sensor networks and react accordingly to optimize resource consumption. In order to do this, the Smart Grids need to understand the existing relationship between energy demand and a set of relevant climatic variables. All smart “systems” (buildings, cities, homes, consumers, etc.) have the potential to employ their intelligence for self-adaptation to climate conditions. After introducing the Smart World, a global framework for the collaboration of these smart systems, this paper presents the relationship found at experimental level between a range of relevant weather variables and electric power demand patterns, presenting a case study using an agent-based system, and emphasizing the need to consider this relationship in certain Smart World (and specifically Smart Grid and microgrid) applications. [* ] Author to whom correspondence should be addressed; E-Mail: gerhard.hancke@ 123456up.ac.za ; Tel. : +27-12-420-3736; Fax: +27-12-362-5000. Video assisted thoracoscopic surgery and lobectomy, sublobar resection, radiofrequency ablation, and stereotactic radiosurgery: advances and controversies in the management of early stage non-small cell lung cancer.